The pictures may take a little while to load. The people in the cages in this photo were Japanese. You can see the same image in a QuickTime movie linked from the following page. 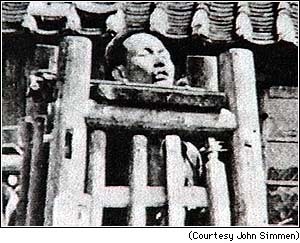 Simmen’s father told him that the Chinese soldiers used a variety of torture methods on prisoners, including suspending them in wooden cages by the neck until they died of starvation. Image of man being tortured. Thank you very much for showing us very intriguing articles and historical photos. Years ago when Chinese caused a riot after China had lost succer game to Japan, I recall that New York Times printed a photo of bunch of mostly naked, mutilated bodies that had been gathered somewhere in Manchuria. The Times article implied that that photo was one of examples of how the Japanese military had been brutal to the Chinese, and the Chinese had historical grievances toward the Japanese. Indeed in the dreadful photo several soldiers clad in the Japanese military uniform were standing, looking down at the bodies that were placed on a platform. One of the legs was sticking out in the photo, and the foot was still wearing a dark smeared tabi, a Japanese traditional footwear for kimono. The tabi looked too tight to wear for the foot since the leg had swollen so much. It was obvious that the victim was a Japanese man or woman, not Chinese person, and the standing soldiers were there on duty guarding the bodies until appropriate measures were taken before the burial orders would come. There were numerous incidents recorded that Japanese and ethnic Korean civilians were attacked by Chinese paramilitary forces or bands of thugs who were called Manchurian Hizoku (bandits). The hizoku were Chinese gangs of thugs who served their local Chinese warlords or military from since the Chinese history started. In a historical sense Chang Kai-shek and Mao Tze-Dong were one of hundreds of warlords China has produced for millennia weren’t they? The recorded ambushes by Chinese paramilitary forces were such as 通州事件, 斉南事件 and 第一次南京事件　to name a few. Usually those Chinese paramilitary bands or hizoku cut off Japanese or whoever the hostages’ head, pulled the eyeballs out, mutilated the bodies, played with the skulls and sometimes boiled the lower part of the bodies for making their power lunch. The women hostages’ bottom was speared through by a long sharp stick and they were gang raped even after they had died. This particular Chinese traditional method of women torture was called 死姦. Perhaps the photo The New York Times showed was from one of famous Manchurian paramilitary force attacks, the 通州事件 in that 104 Japanese civilian men and women, and 108 Koreans were slaughtered and mutilated. The Times article erroneously implied that the photo was about the cruelity of the Japanese military troops that had stationed in China. Aki, thank you very much for digging up the old photos and the very interesting articles. Your post motivated me to write about the old article and photo once I saw in The New York Times. Sorry for my long mumbling.